Day by day, new yacht chapters are being written within the walls of Monterey's shipyard. These chapters embrace prodigious craftsmanship, an abundance of wealthy traditions, a compelling history, and lasting enthusiasm. 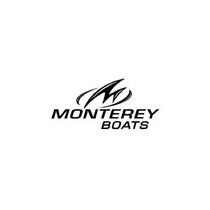 Monterey shipyard carries on the tradition of designing yachts with their expertise unselfishly giving the world one-of-a-kind yachts while astonishing yacht lovers around the world fulfilling their nautical needs. Once again, Monterey shipyard has magically jumped on board and went ahead with the 360 Sport Coupe. This beauty is melting away the boundary between the cruiser and daytime boat. This stunner is furnished with infinite amenities, high-caliber entertainment assets, and wittily designed seating. She is exceptional because the hardtop is connected to the windshield and side windows transform this charmer into the real Sport Coupe. 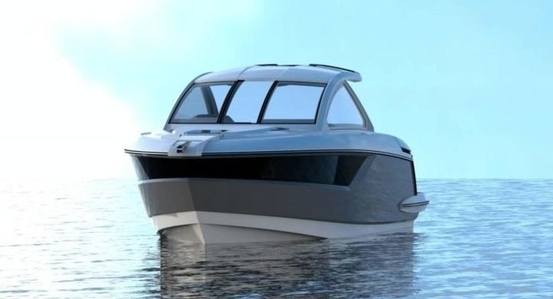 This 360 Sport Coupe review illustrates all the striking characteristics that would attract yacht lovers out there. 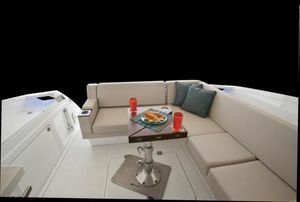 The overall length of the Monterey 360SC is 37 feet and 10 inches and her beam is 11 feet and 11 inches. Starting from performance and depending on the engine, maximum horsepower ranges from T-320 to T-430. The skipper certainly has the best seat in the house. Tilting steering wheel, leather-wrapped, with chrome stainless steel adds opulence coloring to it. Alongside the steering wheel is a docking joystick which assists with precision maneuvering in tight docking areas. 4-inch color engine displays, trim tab AutoGlide system, Raymarine 260 VHF, Sirius Satellite, MP3 adapter, six speakers and Standard stereo masterfully complete the helm with its functionality and practicability. Entry to the cockpit is achieved with a transom door at the starboard of the four-foot swim platform. 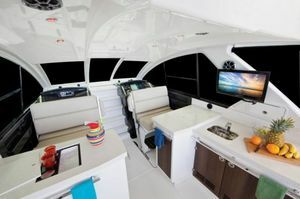 The whole cockpit is covered by the hard top and large windows allowing sensational visibility around the boat. The cockpit is furnished with air-conditioning; nevertheless, one can get ventilation via opening side windows. That’s not all. With a light press of a switch, a colossal front sliding windshield retracts into the hard top bathing the cockpit with lots of air and at the same time shading the aft part in a superior way. A fabulous attribute is the stairs leading to the foredeck because they are wonderfully molded into the cabin door. This is indeed something that’s rarely seen. Another excellent trait is the pilot and co-pilot comfortable seat. They can be flipped around thus becoming the seats of the entertainment center. While serving the entertainment center, these seats are part of the wetbar. The portside wetbar features a place for ice, drinks and even a place for wine bottles which is an extremely functional and useful asset. 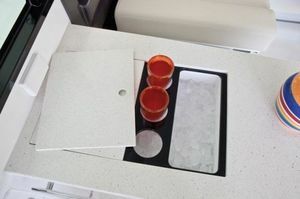 The starboard wetbar comprises the same features plus additional pull out storage. 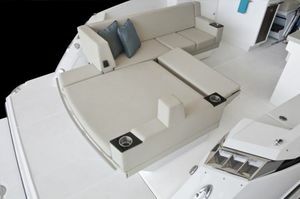 While facing aft, the double-purpose seats confront bars with storage for bottles, another slide out storage and bars with an ice keeper. A wetbar with a trash container, fridge, and a stainless steel sink are nicely incorporated making the cockpit practical and handy. Moreover, a smokeless electric grill is installed and can be neatly slid out to serve its purpose. 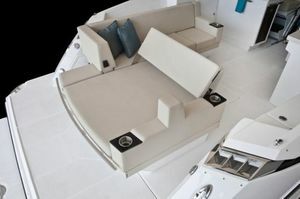 Coming to the foredeck, one can notice lots of sun lounge and cleverly placed drink holders for refreshing while sunbathing and appreciating the scenery. 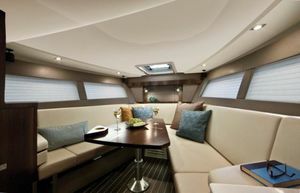 The highlight of the day is probably aft; the cockpit’s open seating area is appareled with a completely upholstered L-shaped sofa and a triangular hi-lo pedestal cockpit table. This sofa has mysterious features of its own. The backrest of the sofa can be moved forward enabling people to sit behind it and watch the swimmers or enjoy the sunset. The lower platform expands accompanied by a covered hatch and underneath is a stainless steel swim ladder with four steps. The wash down for spraying salt from swimming is a nice supplement too. 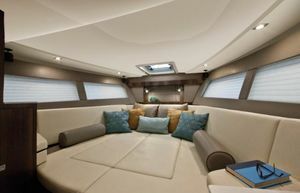 Optional flat screen for the cockpit is also available for forming great living room atmosphere in the open and it concludes a masterfully designed deck. Below deck displays shattering beauty too. In the aft cabin, some features swiftly come to light. For instance, immense windows peacock to the visitors bathing the cabin with sunlight. A V-shaped sofa is somehow self-explanatory presenting itself for family or friends. The table installed between the V-sofa can be lowered with the press of a button. While descended, the cushions of the surrounding sofa can be joined above the table creating an unbelievable berth for sleeping. The galley, embellished with different traits, is connected to this cabin. The galley counter contains a ceramic cooktop and stainless-steel sink hiding under a hatch. A microwave is placed on the counter as well as a single burner electric stove while the refrigerator is big enough, but can be expanded when joined with another one in the cockpit. Monterey’s signature is its fiberglass headliner giving that luxury tone to the whole compartment. Additional lighting is placed throughout the cabin which is warmly bathed in wood and stone. The woodwork is first-class and the stone adds an elegant accent. Standard equipment also comprises of a 32 inch LED TV with DVD Home Theater, a hanging locker, quality four speakers and one subwoofer providing a fulfilling sound. The port side section provides a shower wand and a shower seat. Towels that are monogrammed, together with dinette set and silverware are at one’s disposal. 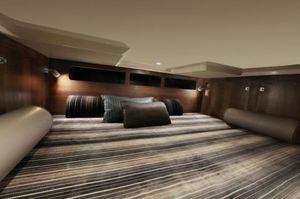 The mid-cabin displays an enormous berth with a huge pillow, quilted mattress cover, a storage case, and an isolation curtain. Additional and worthy to mention standard equipment is the hot and cold transom shower, foredeck sunpads with hinged backrests, twin gasoline sterndrive power, rope, electric engine hatch etc. 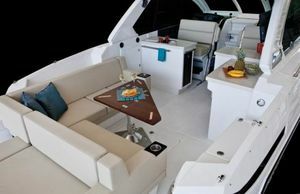 The equipment that is not standard, but optional is aft bimini, icemaker, stereo upgrade, SeaDek inlay, underwater lights adding more delightful experience, bow thruster, swim platform grill, and TV satellite system. 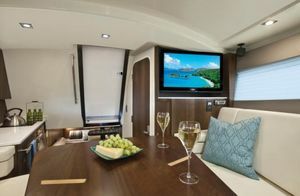 One cannot just focus on entertainment characteristics, performance or the comfort of the Monterey 360SC. All attributes throughout the ship give a one-of-a-kind experience to the crew while sailing. Starting from the helm and ending in the below decks, this charmer has a lot to offer. These are the reasons we all have been waiting to see “Monterey 360SC For Sale". They say that great minds think alike, so don’t miss the opportunity to have this charmer at your disposal. The Monterey 360SC's price is nothing to worry about and there aren’t any obstacles for you to grasp the boat since it’s a must have! Contact us for any information you need and enjoy the ride.